From left: Interior Minister Sar Kheng, new Phnom Penh governor Khuong Sreng, and former governor Pa Socheatvong share the stage at the incoming governor’s inauguration ceremony at City Hall on Wednesday, in a photograph posted to Facebook. Incoming Phnom Penh governor Khuong Sreng vowed to maintain peace and take action against those who wish to destabilize society during a speech at his inauguration ceremony at City Hall on Wednesday. Mr. Sreng, who previously served as deputy governor of the capital, takes control as the ruling party prepares for next year’s national elections, following commune elections earlier this month in which they captured just above 50 percent of the popular vote nationwide. The new governor has developed a reputation for heavy-handed tactics against demonstrators and politically active monks during his time as the deputy. In 2015, he showed up at the independent Wat Samakki Raingsey with over 50 police and military police in tow to “investigate” the pagoda, which often hosts out-of-town protesters during their visits to Phnom Penh. On Wednesday, he struck a tone similar to that of the CPP’s election campaign rhetoric, vowing to maintain peace and stability in the face of unnamed opponents who seek to create social instability. “I vow to take part in maintaining security and eliminate actions of ill-intended groups that wish to foment turmoil in our society,” Mr. Sreng said, adding that he would also adhere to Prime Minister Hun Sen’s 2013 call for reform. 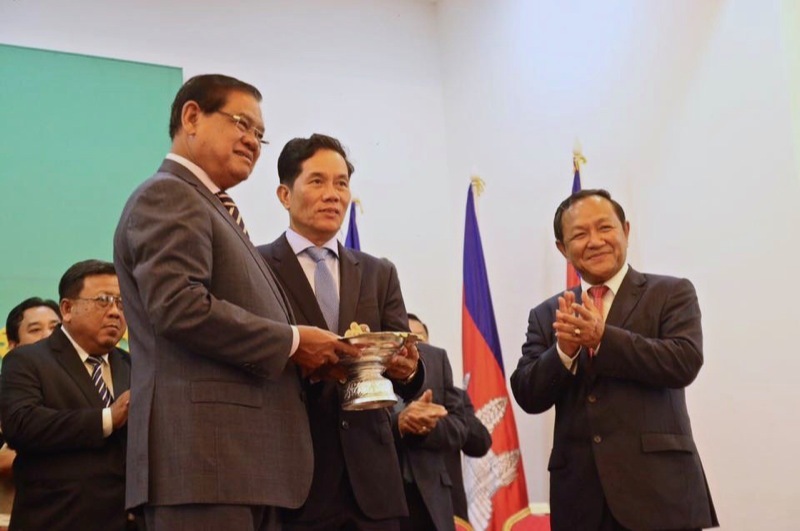 Mr. Hun Sen’s urging in 2013 followed a surprisingly close national election that year, during which the opposition CNRP made significant inroads into the CPP’s support, surprising many observers at the time. In a marathon speech after the election, the premier encouraged ruling party members to take a bath, clean the body and look in the mirror—a call to end corruption and change business as usual. Outgoing governor Pa Socheatvong, who has served as the capital’s chief since 2013, used Wednesday’s speech to boast of the government’s accomplishments during his tenure, noting that authorities had cracked down on 1,703 cases of drug crime and resolved 4,194 demonstrations and strikes. A royal decree issued on Tuesday by King Norodom Sihamoni appointed Mr. Socheatvong a personal adviser to Mr. Hun Sen, a role equivalent to a senior minister. Two new deputy governors—Kouet Chhe and Nuon Pharoth—also took office on Wednesday, replacing Mr. Sreng and another deputy governor who had finished his mandate.